From Proto Nuclear Polynesian *Lama, a tree used for making torches; a word which can be traced back through Proto Polynesian *Lama, "torch", to Proto Oceanic *ma-ramaR "shine, shining, bright", and beyond, possibly to Proto Austronesian. See the link at the top of this page, and the discussion under words associated with *niu, "coconut" for the full etymology of this word. Samoan: Lama (Aleurites moluccana, "Candlenut tree ", Euphorbiaceae). Hawaiian: Lama (Diospyros hillebrandii & D. sandwicensis, "lama, ēlama", Ebenaceae). Mangareva: Rama (Aleurites moluccana "Candlenut tree ", Euphorbiaceae). Horopito (originating in Aotearoa) is an alternative name for Pseudowintera colorata. Watch this space! This page is still very much under construction, but contains the essential linguistic and botanical information. Both text and pictures will be added progressively as soon as time permits. See the "News" for February 2016 for more information. 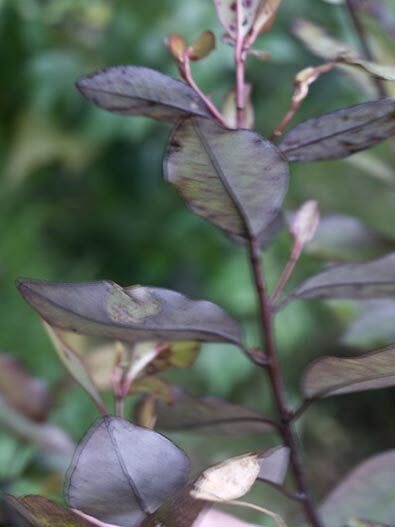 These plants get their shared name (ramarama) from the way their colourful and variously hued leaves reflect or give the impression of light. 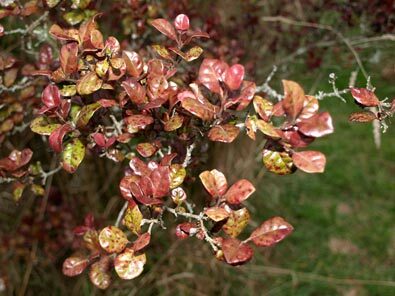 Lophomyrtus bullata is often found near streams and in damp places in the bush, and the horopito (Pseudowintera) has peppery leaves which have important culinary uses. 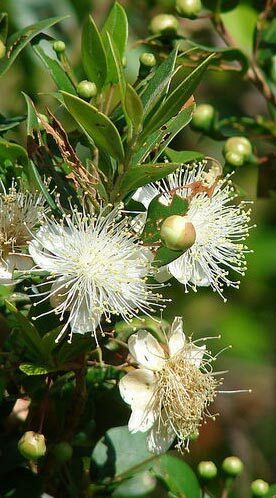 The Ramarama is closely related to the "Common Myrtle", Myrtus communis, of Southern Europe, the Middle East, and North Africa. It was originally grouped by Daniel Solander, the Danish naturalist who accompanied James Cook on his South Sea expeditions, in the same genus, but later botanists reassigned this and another species to the endemic genus Lophomyrtus. When fully grown, the New Zealand species may be taller (up to 6 metres, as against around 2 metres) than its European counterpart, the leaves are more colourful and varied in shape, and the branches are not fragrant like those of the Myrtus, but, as you can see from the photographs of the flowering myrtle to the left and the ramarama below, the family likeness is unmistakable. The plants also have similar, dark shiny berries and thrive in damp environments like the banks of rivers and streams. The ramarama was thus a natural choice for the biblical translators to represent the Middle Eastern Myrtus communis, hadas in the Hebrew original. There are seven tree names in this passage. In the Māori text five of these are local names inherited from earlier stages in the development of what became te reo Māori. One (rākau hinu, "oil tree"), is a descriptive phrase for the olive, and only one, hita, the assimilated form of English "cedar", is adopted from another language. The impression of change for the better and renewal underlying the original Hebrew text would thus have been immediately accessible to mid-nineteenth century Māori listeners and readers with little direct acquaintance with the trees referred to in either the Hebrew original or the English translations. It may be noted that in this particular case, the selection of tree names in the Māori text parallels that in the seventeenth-century English-language Authorized ("King James") version, rather than more modern translations like the Jerusalem Bible (and the New Revised Standard Version, the Good News Bible, and other widely-circulated contemporary translations). This is because the precise meanings of many of these plant names is unclear, and recent comparative research, utilizing evidence from Arabic and other languages related to Ancient Hebrew, as well as Ancient Greek and Latin sources, has thrown new light on what specific plants the Hebrew writers may actually have had in mind when they wrote the original texts, resulting in name changes between and among different editions. Nonetheless the species first referred to by a particular word often remains a matter of conjecture and thus open to different interpretations (as is illustrated by the variations in the alternative English translations above). The English-language translators and their Māori-language colleagues have tended to substitute the name of a plant with qualities similar to those of the plant named in the Biblical text, and likely to be familiar to their audience, rather than to attempt to stick rigorously to a literal translation of the Hebrew (or Greek) word in the original text. Hence the predominance of Māori plant names in the verse quoted above. Translators into other Polynesian languages tend to have taken a much more conservative approach. The Samoan version of Isaiah 41:19, for example, in effect leaves the tree names untranslated, following the King James and Māori interpretations of the reference to olives, "laau e maua ai le suāuu" (oil-bearing tree), and adapting the Hebrew words for the six other trees to Samoan phonology, in order: arasi (erez), setima (shittim - plural of shittah), atasi (hadas), perosi (berosh), titara (tidhar), and tasura (teashshur). The Tahitian text follows exactly the same pattern, with "raau hinu" (oil tree) in the vernacular, and the rest Tahitian adaptations of the Hebrew words: arezi, sitima, hedesa. berusi, tedera, and tasura. None of those are words in common use (even some of the letters used in the transcriptions, b,d,s,z in Tahitian and r in Samoan, are not used in writing indigenous words), and the text would have to be explained carefully to have its intended impact. Translators into other Polynesian languages generally follow the Samoan and Tahitian pattern, with occasional deviations into the vernacular. 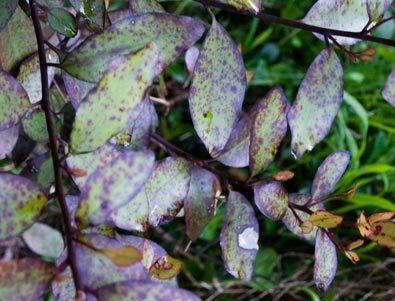 In the passage we have been discussing, for example, both the Niuean and Rarotongan translations use adaptations from the Hebrew for most of the plant names, but translate hadas (myrtle) as maire (Rarotongan) or maile (Niue), the name of the fragrant vine used in leis, chaplets and other expressions of friendship and rejoicing. Hawai'ian, however, sticks to the Hebrew-derived hadasa, despite the extensive use of maile in Hawai'ian culture. Tahitian also adopts the Hebrew word, in the form of hedesa, while Niuean uses its adaptation of the Hebrew, hatasi, where the myrtle appears elsewhere (the books of Nehemia and Zechariah) in the Bible. The shift in the Niuean translations to and from a local word in preference to one adopted from Hebrew for what in the Biblical texts is one plant may have been influenced by the context. The Polynesian maile / maire are shrubby vines of the genus Alyxia. Alyxia stellata is the species found in Niue and the Cook Islands. It does grow as a small shrub in the forest, but perhaps not as large as might be expected in the references in Zechariah to horsemen assembled in a grove of such trees. On the other hand, the early Polynesian settlers seem to have had no hesitation in bestowing the name maire on several large trees of the genus Nestegis, and the translators into Rarotongan have followed this bold precedent. References and Further Information: There is information about the ramarama in the general works on New Zealand trees and plants listed in the bibliography, and on the NZ Plant Conservation Network web site. There are many sites devoted to "Plants of the Bible" on the web; one of the best is maintained by the Old Dominion University, Norfolk, Virginia, which has extensive information about these and other Middle Eastern plants (including those mentioned in the Quran), references to the Biblical texts in which their names appear, and related matters. Michael Zohary's Plants of the Bible (Cambridge University Press, 1982) is also an invaluable source of linguistic and botanical information. The versions of the Bible from which quotations have been taken are also listed in the bibliography. 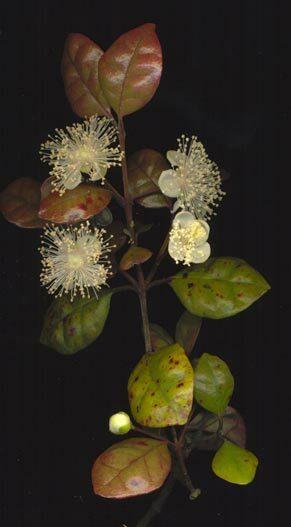 Photographs: The photograph of the flowers of Lophomyrtus bullata is by Wayne Bennett (NZ Plant Conservation Network), used by kind permission, as is that of the common myrtle, by Forest and Kim Starr. The others are of plants in Te Māra Reo. More photographs are to come, along with additional information about these plants.